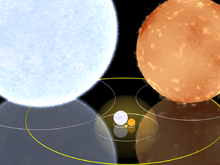 English: Gamma Orionis, Algol B, the Sun, and the objects from Image:1e8m_comparison.png, to scale. Note that the star surfaces are entirely my interpretation, and I am not an astronomer. Quelle Planetary texture maps (with the exception of Earth) and Earth's cloud map from Celestia, used under the GPL, version 2. Earth's surface is a monthly Blue Marble Next Generation image from NASA, and thus public domain. My own contributions to this image (which are mainly the stars) are available under the GPL, v. 2, and other licenses. See User:Paul Stansifer/Size comparison for more details and the other licenses. Version with transparency set and different textures and lighting.